Well, I’ve just finished watching the most screwed-up Oscar broadcast in history. I’m frustrated and baffled . . . and how else is a viewer supposed to feel when a Best Picture winner is announced and then (mid-acceptance speech) the Oscar is rescinded? Not that the eventual winner, Moonlight, is unworthy. Frankly, I’d like to watch this film again, because -- though I recognized some fine performances -- I wasn’t among those who fell in love with the total package. But in any case I was rooting for La La Land, for the honor of my hometown, and for the revival of musicals on the silver screen. I’ve been thinking about musicals a lot since I finished reading a highly touted new novel by the British author Zadie Smith. Swing Time begins with two little mixed-race London girls who are wild about dance. Their passion is fueled by the hours they’ve spent in front of the telly, watching the great old musicals. 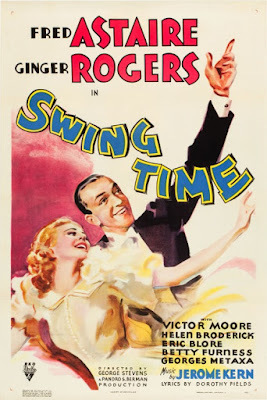 One that figures prominently in the narrator’s recollection is Swing Time, in which (in a number called “Bojangles of Harlem”) Fred Astaire dances elegantly with three shadow-images of himself, all of them done up in blackface in tribute to Bill Robinson and the great black tap dancers of the era. 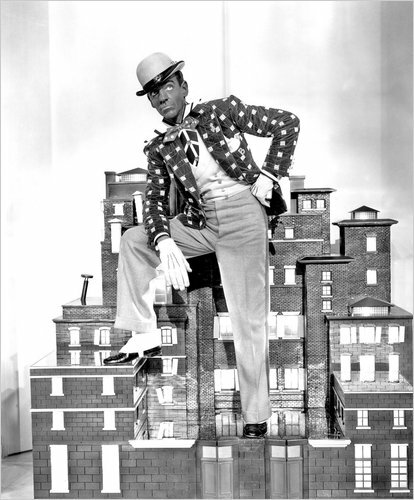 And when watching something called Ali Baba Goes to Town the narrator is surprised to spot an actual African-American featured dancer, Jeni Le Gon (1916-2012), whose unusual legacy becomes part of the plot. As a more recent inspiration, Michael Jackson appears too, via his Thriller music video. In the course of the story, the two little girls grow up. One becomes a professional dancer, with some chorus-line successes on the London stage (she’s Hot Box cutie #1 in a revival of Guys and Dolls) until life takes its toll. The narrator, smarter and less agile, goes the university route. Unexpectedly, she becomes the personal assistant to a world-famous Australian singer-dancer whose character and blonde beauty obviously borrow from such gifted self-promoters as Madonna and Lady Gaga. The celebrity becomes temporarily infatuated with Africa, swooping down from her heights to play at philanthropy while taking on some new dance styles, a new lover, and an adopted baby girl. It’s cultural appropriation to the nth degree, and the playing out of this story is set against those of the narrator’s social activist mother and her childhood friend. There’s much in this novel that’s grim and sad, but the joy of dance remains, both in the rituals of an African village and in a final image of a struggling little family group dancing on the balcony of a London tenement flat. It was joy I wanted on Oscar night, and (despite some overly silly stuff from host Jimmy Kimmel) I was happy to see dance held in a place of honor. Justin Timberlake and his crew can dance down my aisles any day. There was lovely, magical dancing in the Moana number for which Lin-Manuel Miranda did not become an EGOT. And of course “City of Stars” from La La Land got the Astaire-Rogers treatment it deserved. But I’d like to dance some flamenco on the heads of Warren Beatty, Faye Dunaway, or those important-looking guys with the suits and briefcases from Pricewaterhouse-Coopers . . . whoever was responsible for the wrong name being read at what should have been the evening’s high point. But, come to think of it, La La Land is about melancholy as well as joy, and so maybe its fate is appropriate. I guess we should shrug our shoulders, face the music, and dance. Postscript: The latest word is that there are two identical sets of Price-Waterhouse envelopes, one on each side of the stage. In the confusion of a complicated set change, Beatty was handed the wrong envelope, was confused by what he read (Emma Stone, La La Land) but passed the buck to Dunaway. So lots of blame to go around. Who could have guessed that our politicians would become so interested in bathrooms? First in North Carolina and now in Texas, politicians are vying to force transgender men and women to use the restrooms matching the gender status on their birth certificates. Why this hubbub? The politicos are convinced that some men might choose to put on dresses in order to assault women in the privacy of bathroom stalls. Frankly, I can’t see would-be rapists getting quite so creative. But the whole issue has reminded me that in more innocent times a man dressed up as a woman was a matter of high (or maybe low) comedy. Drag is, in fact, an ancient theatrical tradition, dating back to the days when all actors were male. (That’s the way it was in Shakespeare’s time, Gwyneth Paltrow’s role in Shakespeare in Love notwithstanding.) After women were allowed onto the stage in eighteenth century England, there remained a British fondness for the “dame show,” featuring a large middle-aged male comically dressed as a buxom maternal type. The “dame” still shows up, particularly in the holiday season, in English-style pantomime. And then of course there’s naughty Dame Edna, as flamboyantly portrayed by an Australian actor, Barry Humphries. 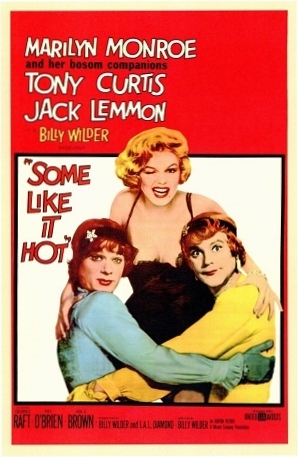 Some Like It Hot was obviously in someone’s mind when TV execs launched Bosom Buddies in 1980. This sitcom, which lasted until 1982, featured newcomers Tom Hanks and Peter Scolari as two young ad men who – having lost their New York apartment – disguise themselves as women in order to move into the low-rent Susan B. Anthony Hotel. Hanks’ innocent charm led directly to his leading role in Splash, and the rest is movie history. But in 1980 future Texas legislators were more likely watching a dark little Brian De Palma film, Dressed to Kill, in which cross-dressing is an evil (and eventually deadly) secret. Cross-dressing and transgender issues (which of course are not exactly the same thing) show up far more sympathetically in 1992’s The Crying Game, which made a shocking secret out of one character’s biological identity. And Hilary Swank won an Oscar for the true-life story of Brandon Teena in 1999’s Boys Don’t Cry. In that film, Swank’s character struggles with the fact that she considers herself male, despite biological evidence to the contrary. She ultimately pays a high price. But I don’t recall her being punished for daring to use a men’s bathroom. Even when Hanks is a passenger, bad things happen. 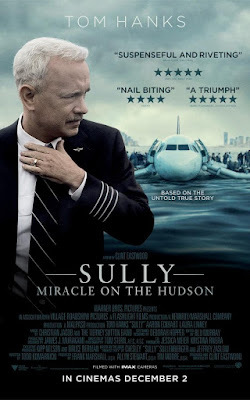 Traveling for his job as a FedEx systems engineer, he faces a weather-related crash off the coast of Malaysia. A life raft deposits him on a nameless tropical island where he survives for four years with only a volleyball for company. When he finally gets back to Memphis, he discovers his long-term fiancée has married his dentist. Maybe he had the right idea back in 1984, where as a skinny and curly-haired young man newly elevated from TV sitcomland, he fell in love with a mermaid and followed her into the briny deep. I’d hope our Tom faced better odds under the sea than he later did when traveling on the water and in the air. Tom Hanks’ career tells us something about stardom, Hollywood-style. Though a gifted actor, he’s bigger than the roles he plays, and we in the audience can’t help responding to our sense of his personality as well as to his characterizations. I doubt we’d buy Hanks as an exotic foreigner, and his bad-guy roles are rare. (Even when he plays a hitman in Road to Perdition, he’s a good-hearted hitman.) What we see in Tom Hanks is a quality he shares with Jimmy Stewart: the amiability of an American everyman. Stewart played light comic parts (Harvey, The Philadelphia Story), inspirational roles (It’s a Wonderful Life, The Spirit of Saint Louis), and eerie dramas (Hitchcock’s Rear Window and Vertigo). Whatever sort of role he played, we were on his side. For Tom Hanks we tend to feel the same sort of trust, whether he’s making a film or living his life. Even if his luck with modes of transportation is lousy, maybe he’s the Mr. Smith we’d like to see in today’s Washington. Having just seen Denzel Washington’s production of Fences at my local multiplex, I’m collecting my thoughts about the film’s Oscar chances. Fences, of course, is part of August Wilson’s so-called Pittsburgh Cycle of ten plays about the African-American experience. It reached Broadway in 1987, in a production toplined by James Earl Jones as Troy Maxson, a sanitation worker who once dreamed of baseball stardom. That production won Wilson and company a slew of Tony Awards, plus a Pulitzer prize. Wilson was long ago approached by Hollywood regarding Fences. He made it clear he would never permit the play to be filmed unless a black director was at the helm. Still, before his death in 2005 at age 60, he wrote a screen adaptation of his stage play. The very enterprising Scott Rudin (Ex Machina, Captain Phillips) suggested Denzel Washington bring Fences to the screen, and this idea evolved into a much-lauded 2010 Broadway revival, starring Washington as well as Stephen McKinley Henderson, Mykelti Williamson, and the magnificent Viola Davis. All four have ended up in Washington’s film version, along with some excellent younger actors. 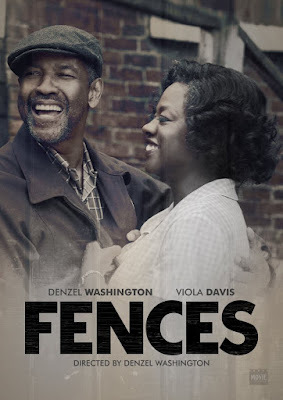 So how do I feel about Fences as a movie? It’s a powerful representation of August Wilson’s theatrical world. It’s valuable in bringing to audiences who’ve never seen a Wilson play an articulation of his motifs, like the impact of the past upon the present and the role of racism in crushing (or cruelly twisting) the black man’s spirit. But despite its Oscar nomination as one of the year’s best films, Fences remains at heart a play. And though August Wilson earned a posthumous nomination for adapting his own stage work into a screenplay, a quick look back at the original suggests to me that not much has been changed to take advantage of the screen’s unique properties. A Wilson play is all about language, its ebbs and its flows. Wilson characters deliver lengthy speeches full of poetic rhythms that can make them resemble arias. Yes, director Washington has added some visuals: street scenes, a glimpse of Troy Maxson and his crony Bono at work on a garbage truck. But mainly we have static locations (chiefly the crammed yard of Maxson’s Pittsburgh row house) and far more talking than most movies can handle. It’s brilliant talking, wonderfully executed, but this didn’t feel like a movie to me. I also have mixed emotions about giving acting awards to performers who’ve just finished playing the identical roles on stage. As strong a performance as Washington gives, he’s already been duly rewarded with a Tony. Yet there’s talk about him becoming the new frontrunner for a Best Actor Oscar, given that he triumphed at the SAG Award ceremony over Casey Affleck of Manchester by the Sea. As always, external forces may be at work here. Affleck has some messiness in his past (accusations of sexual harassment) that may make some squeamish about supporting him, despite the stellar nature of his performance as Lee Chandler. And it’s tempting to see this shaping up as a year with an #Oscarsoblack tinge. But Denzel Washington isn’t lacking for Oscars on his mantel, and I’m personally in awe of Affleck’s subtle work. Of course, I don’t have a vote. Viola Davis is another story. I could argue, certainly, that what she gives is a Best Actress performance. Putting her in a Supporting Actress category is slightly unfair to her fellow nominees, like Michelle Williams and Naomie Harris, who do exceedingly well with much less screen time. But Davis has been due for years, and it seems her moment has finally come. Humorous or Haunted: Will the Real Shirley Jackson Please Stand Up? Some readers think of Shirley Jackson as a highly perverse writer with a taste for the macabre, the author of such creepy stories as “The Lottery.” (Stephen King is a serious fan.) Others remember her as a happy homemaker, someone who chronicled the misadventures of her four kids with both exasperation and amusement. Jackson’s Life Among the Savages and Raising Demons, highly popular in their day, made her a kind of forerunner to Jean Kerr (Please Don’t Eat the Daisies) and Erma Bombeck, both of whom wrote about domestic life with love and glee. I’ve just finished a fascinating new biography by Ruth Franklin. It’s called Shirley Jackson: A Rather Haunted Life, and it argues that Jackson’s spooky predilections and her affectionate regard for her brood reveal two sides of a very complex personality. Shirley loved her kids and her kitchen. In an era (the Fifties) when being a housewife was considered a high calling, she excelled at whipping up creative meals, tending the family pets, and stimulating her children’s already-active imaginations. On the other hand, surrounded by her busy brood and a husband (critic Stanley Edgar Hyman) who was not a reliable helpmeet, she had to fight desperately to find time to sit down and write, an obligation that was all the more necessary because she was the family’s financial mainstay. 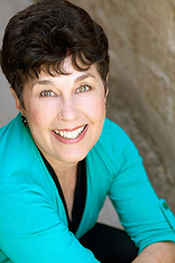 Nor did her own inner resources make life easier: she hated her physical appearance and fought a losing battle to please her stern, unyielding mother. Later in life (she died of heart failure at the all-too-early age of 48) she struggled with agoraphobia. Which meant that for months at a time she was reluctant to stir from her large and ramshackle Vermont house. Given her penchant for writing haunted-house stories, her neurotic fear of leaving her own hearth and home speaks volumes. After finishing the Jackson biography, I was moved to read more of Jackson’s own writing. I was promptly floored by the power of her last completed novel, We Have Always Lived in the Castle (1962). This eerie experiment in first-person narration takes us into the mind of a young girl with a very unusual perspective on life. 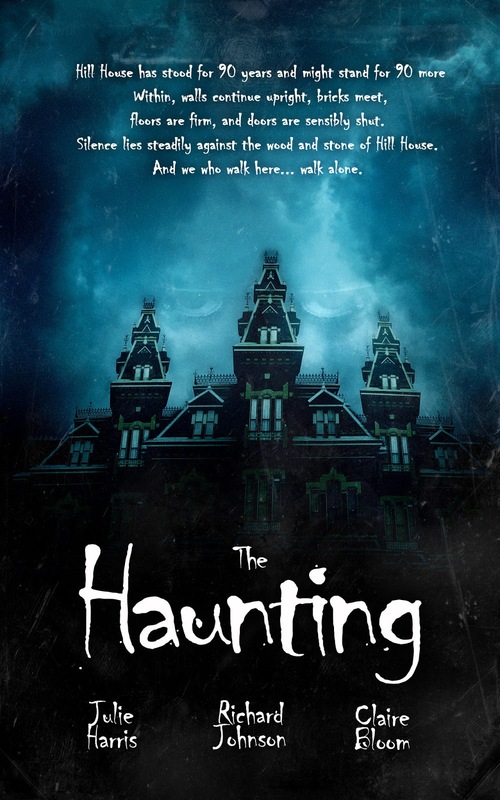 Once again there’s a disturbing old mansion, and two unforgettable female characters who live in a world of their own making. (Yes, it sounds a bit like the real-life Grey Gardens.) Upon reading it, I thought it was ripe for film adaptation . . . then discovered that a new British film of the novel will be released this year. Will it do Jackson justice? We shall see. This isn’t much of a Valentine’s Day post, I realize, but some might argue that Jackson’s personal dichotomy illustrates what marriage is all about: two parts domestic delight and one part horror. Not that I’m speaking personally, of course.